The Northern Lights are magical and elusive. Like whale watching, you can go out and wind up not seeing anything at all. That's extra disappointing because it's undoubtedly damn cold wherever you're trying to see the aurora. Off the Map Travel has come up with a fun way to make the whole situation a little more tolerable. They've put a hotel room inside a sled, and they'll bring you and your room to the Northern Lights in the Arctic reaches of Finland. Each fifteen-by-eight sled room fits two people. The room on rails is equipped to withstand the sub-zero temperatures with a "super wide" bed, dining table, gas heater, and an external dry toilet. 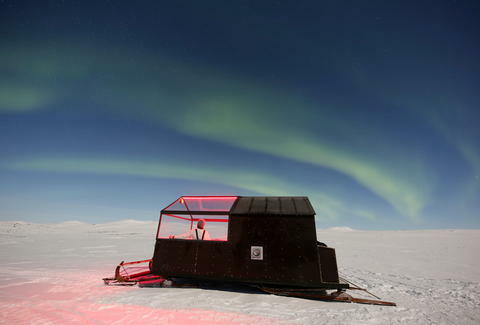 But, not only are you going to be out near the Northern Lights, your sled will have a glass roof so you don't even have to leave the warmth of your room to see the magic in the sky. 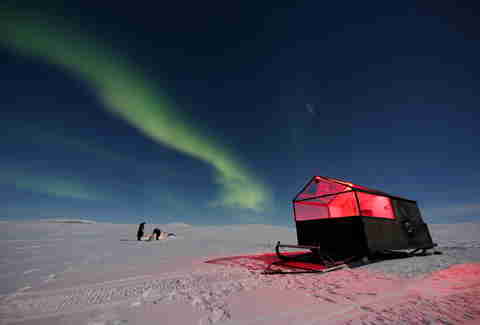 Each night in a sled starts at 6pm when a guide takes guests by snowmobile to their room. They'll be shown how to start a campfire and grill local sausages before they're given the camp to themselves for the night. Guests also are treated to local snacks and hot drinks, as well as a warm breakfast brought to the sled in the morning. If you want to get out to explore the Arctic wilderness around the small northern village of Kilpisjärvi, the room is equipped to fulfill your desires. You've got personal kicksleds and snowshoes to get you out in the bracing cold. "The wilderness surrounding Kilpisjärvi is known for its remote and uninterrupted Arctic tundra," said Off the Map founder Jonny Cooper. "Away from any manmade light pollution, it is here that the wilderness camp is placed for the winter, giving guests the best possible opportunity to experience the Northern Lights and simply enjoy the silence of the Arctic plains." This far north, your odds of catching the Northern Lights are pretty decent. That's especially true compared to lower latitudes where the solar cycle has a greater impact and is currently making the Northern Lights less frequently visible. These amazing mobile rooms are only available through mid-April, and there are only three of them. If you miss out, the sleds will be back in January of 2019. 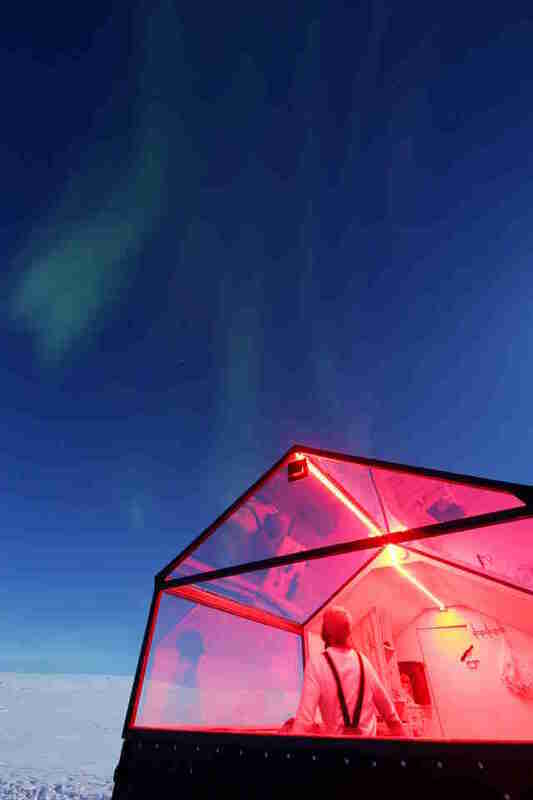 Or you can head elsewhere to catch the Northern Lights from a glass igloo, heated inflatable bubbles, or a sauna in a floating hotel.